Apple has pitched the idea of introducing more than a dozen new emojis with a focus on disabilities. 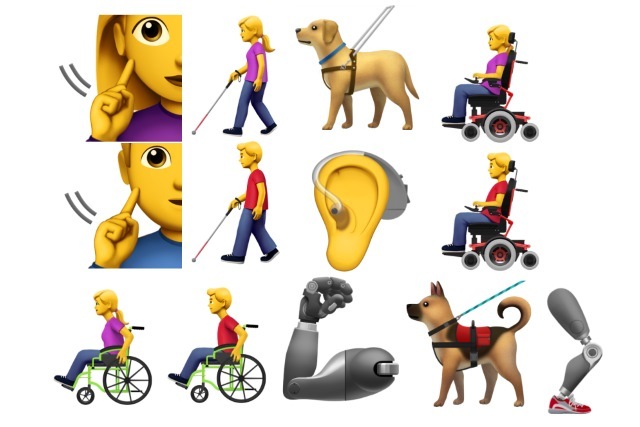 In a submission to the Unicode Consortium, the iPhone maker suggests 13 new emojis depicting a guide dog, wheelchair users and prosthetic limbs. The company says that the current batch of emojis do not represent people with disabilities, and it would like to redress the balance. For now, just a limited number of disability-focused additions have been suggested, but Apple says that this should just be the starting point. Apple has consulted with a number of groups and communities, including the American Council of the Blind and the Cerebral Palsy Foundation, and says that the new emojis would be a step towards greater inclusivity and representation. The company points out that there are many hidden disabilities -- such as PTSD and Autism -- and for this, the "service dog with a vest and leash" is suggested. One in seven people around the world has some form of disability, whether that be a physical disability involving vision, hearing, or loss of physical motor skills, or a more hidden, invisible disability. The current selection of emoji provides a wide array of representations of people, activities, and objects meaningful to the general public, but very few speak to the life experiences of those with disabilities. This new set of emoji that we are proposing aims to provide a wider array of options to represent basic categories for people with disabilities. This is not meant to be a comprehensive list of all possible depictions of disabilities, but to provide an initial starting point for greater representation for diversity within the emoji universe. For each of the emojis featuring a person, different skin tone options would be available, increasing the number to 45 in total. The technical committee of Unicode will be meeting next month to discuss Apple's suggestions and other proposals. It is possible that the new images could be added in Emoji 12.0 which is due for release in the second half of 2019.